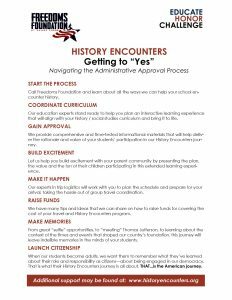 Need a tool to help you work through the steps typical of gaining approval to bring your class to our History Encounters program? Our Getting to “Yes” document provides a list of steps to consider as you navigate this essential process. You can view the steps below or download this document by clicking on the graphic to the right. Call Freedoms Foundation and learn about all the ways we can help your school encounter history. Our education experts stand ready to help you plan an interactive learning experience that will align with your history / social studies curriculum and bring it to life. 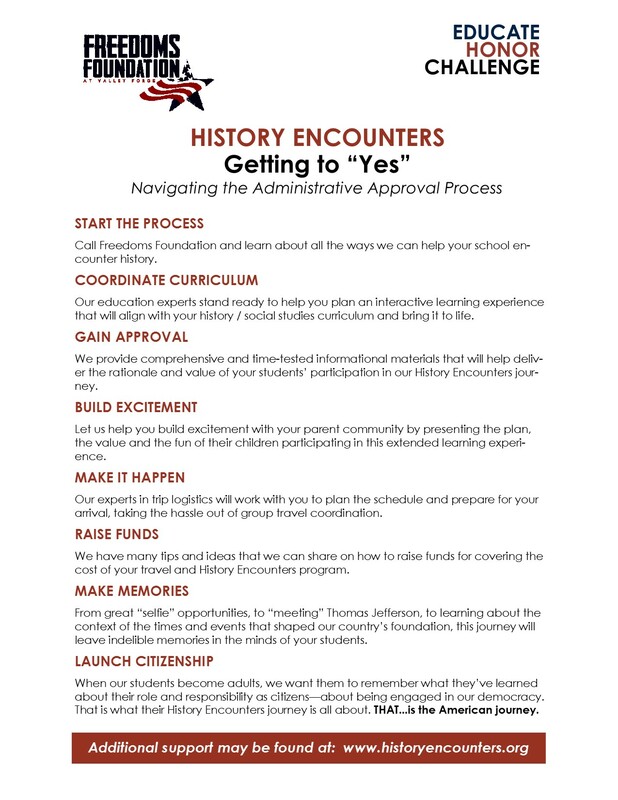 We provide comprehensive and time-tested informational materials that will help deliver the rationale and value of your students’ participation in our History Encounters journey. Let us help you build excitement with your parent community by presenting the plan, the value and the fun of their children participating in this extended learning experience. Our experts in trip logistics will work with you to plan the schedule and prepare for your arrival, taking the hassle out of group travel coordination. We have many tips and ideas that we can share on how to raise funds for covering the cost of your travel and History Encounters program. From great “selfie” opportunities, to “meeting” Thomas Jefferson, to learning about the context of the times and events that shaped our country’s foundation, this journey will leave indelible memories in the minds of your students. When our students become adults, we want them to remember what they’ve learned about their role and responsibility as citizens—about being engaged in our democracy. That is what their History Encounters journey is all about. THAT…is the American journey.